The Sea Organ. Photo by The Real Croatia. Located on the shores of Zadar, Croatia, a monotonous sea wall erected after World War II was transformed into the world’s first pipe organ that plays music using wind and waves. Designed by Nikola Bašić in 2005, the architectural instrument has a system of polyethylene tubes and a resonating cavity, underneath a set of large marble steps. The Sea Organ is 230 ft. long and narrow crevices are carved into the steps that lead to organ pipes. When the waves lap against the steps, air is pushed through the pipes to make enchanting, unrehearsed and gentle sounds – similar to a wind chime. It would appear that this might be the greatest lengths any demolition project has ever approached in order to save a population of smelt, and that is why we love San Francisco. Gif file: Gizmodo.au. This fall, before 9072 tons of dynamite are detonated, likely this month, when waters are believed to be least teaming with fish and mammals, a diffusion of bubbles will be cast around the bridge in order act as an alarm, hopefully dispersing and deterring wildlife from the area. An audio recording will also be played in hopes of warding off birds, too. Photo credit: The Lemperle Residence / Jonathan Segal FAIA/© Paul Body. I’ve spent my fair share of time in La Jolla, but this is one room from the likes of which, I assure you, I’ve never peeped a Pacific sunset. A few months ago, we posted a sneak peek of the world’s tallest masts (55-ton, 91-100 meter masts (300-328 ft) en route to the 142.8 meter (468 ft) Sailing Yacht A, the world’s largest sailing yacht. Recently, she began her sea trials and was on display for all the public to see. The Bellosguardo Estate. Photo by Buddy Moffet. Hidden above one of the most valuable stretches of coastline in California lies a 21,666-square-foot French mansion that has been empty for close to 60 years. Bellosguardo was the summer home of copper heiress Huguette Clark and sits on 23 acres overlooking Santa Barbara and the Pacific Ocean. After Huguette’s mother died, she did not return to the estate because her memories were too sad to want to stay there. The last time she visited was in 1953, nearly six decades before her own death in 2011. Photo by Karsten Moran for The New York Times. Last week, a carousel like you have never seen before, opened in Lower Manhattan’s Battery with an interesting twist, instead of horses – fish await for your ride through an underwater world. The stainless steel ‘tank’ reflects electric bioluminescence and aqueous patterns are projected on the nautilus -inspired ceiling. This immersive sensory environment is accompanied by ‘bubbly’ sounds, adapted from Mozart’s 40th Symphony and Prokofiev’s Romeo and Juliet. The SeaGlass Carousel is 46 feet in width with 30 mechanized fish as your chariot. Photo by Karsten Moran for The New York Times. One of the Strandbeests. Photo by Lena Herzog from The New Yorker’s article on artist Theo Jansen. Since 1990, artist Theo Jansen has been creating ‘Strandbeests’, which translates to beach animals in Dutch. The strandbeests are assembled from stiff plastic tubes and then animated by wind to walk like alien creatures along the shore. 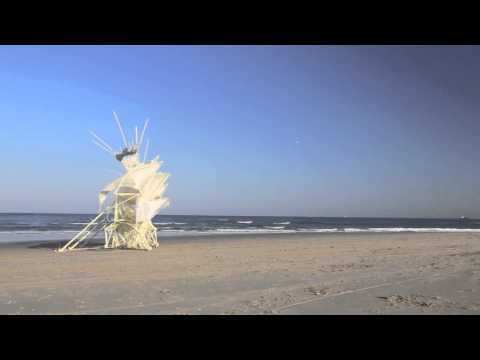 Video from the Strandbeest Webshop. The kinetic beasts were originally designed to throw sand onto degraded dunes to help protect against loss from storm surge or sea level rise. What has occurred since then, are multiple generations of Strandbeests – divided much like geologic eras and each christened with a scientific-like name such as Animaris Duabus Caudis. According to Jansen’s Web site, he makes these skeletons to walk on the wind, so they don’t have to eat. His vision is to have herds of Strandbeests, that are self sustained to roam and live their own lives.